A cop that is out thought will almost always be outfought. Col. John Boyd's ideas demonstrate that there was more to the resolution of conflict than just going there with high diddle, diddle straight up the middle tactics when other maneuvers and options could be applied. Good tactical responses require thinking. All too often the focus of police reaction to conflict and violence was inward thinking on some policy, procedure, checklist or school solution, on elaborate step by step methods rather than outward thinking on the situation or problem at hand. We see cops all too often being out thought and ultimately outfought as they react to conflict. Its time we stop reacting and start reshaping our tactical environments. As Boyd said; "lets not just be a reactor...be a shaper too." Here he is discussing "adaptability" or what cops like to call "street smarts" or 'common sense" as the key to winning on the street. I normally do not post a book before I have finished but I am making and exception here because early on the book it has already bridged some gaps in my thinking about Boyd as it applies to policing. Keep in mind this book is written for the military. However as Boyd encouraged us to do expanding them to policing works and works very well. I have been expanding Boyd's ideas to policing for going on two decades now. Patterns of Conflict, the Strategic Game of Interaction and Isolation, Destruction and Creation and Organic Design for Command and Control. All when thought about expanded on and adapted have a profound impact on policing strategy and tactics and how they influence the moral, mental and physical categories of conflict. I found the same thing in my journey, discovering Boyd's ideas that in policing the only thing really talked about when it came to John Boyd was his OODA loop and that was a dumb-down linear version way too overly simplified as to almost render it useless. The OODA loop is much more intricate and more complex than a loop, more like a "pinball machine" of decision making that requires constant observation, orientation, decision and action throughout the tactical dilemma a cop is faced with, to be effective. Anyhow the more I explored and discovered about Boyd's work, the more I learned and the more I felt I should write about and teach it to cops. 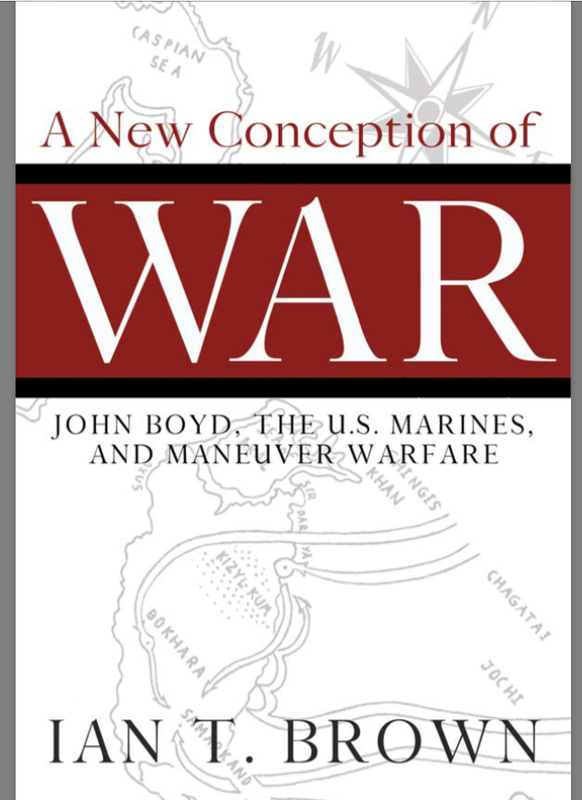 A New Conception of War: John Boyd The U.S. Marines and Maneuver Warfare will be another tool, another resource to continue the journey of discovering more effective ways to do what it is we do. So, I am happy to share this book (download it for free) and highly recommend you guys will read the book, and I will read it (as I began it last night), but as my good friend Don Vandergriff asked this morning "when is someone going to say this is all good, the doctrine, is someone going to tell the Marine Corps or Policing emperor that they have no clothes as long as they continue to worship at the alter of the Manpower that evolved from theories and out of date practices made more than a 100 years ago?? Culture eats strategy for lunch!! This book I predict will take us beyond surface learning if we step up and apply its lessons and have a great impact on how we train, develop and LEARN, how we lead and ultimately how we deal with crisis situations using strategy. operations and tactics that influence the moral, mental and physical categories of conflict. I will be posting more on this book as i go through it. In the meantime i would love to hear your feedback.